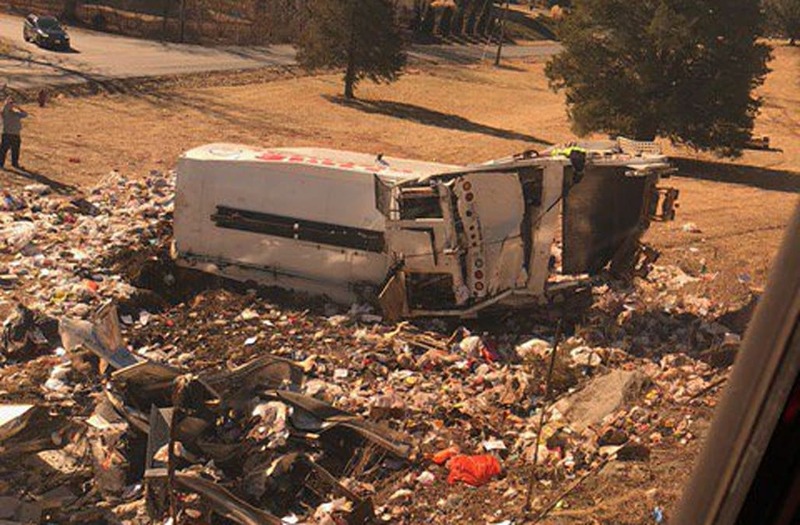 WASHINGTON, Jan 31 (Reuters) - An Amtrak passenger train carrying Republican members of the U.S. Congress from Washington to a retreat in West Virginia slammed into a garbage truck on Wednesday at a rural Virginia road crossing, killing one person on the truck, authorities said. No serious injuries were reported among the lawmakers or their staff on the train, the U.S. Department of Transportation said. There was one death and one serious injury among those on the truck, it added. Amtrak said two crew members and three train passengers were hospitalized with minor injuries after the crash in Crozet, Virginia. One of those, Representative Jason Lewis of Minnesota, was examined for a possible concussion. Sources say @SpeakerRyan is fine. He was not injured in the train crash with a truck as GOP lawmakers travel to WVA retreat. "I'm fine compared to, tragically, the truck drivers, and thankful for the prompt action of our doctors and first responders. My thoughts are with the family of the driver who passed away," Lewis told Reuters. The train was taking lawmakers to an annual retreat being held this year in White Sulphur Springs, West Virginia, just west of the Virginia state line. Amtrak said the collision occurred at 11:20 a.m. in Crozet, a tiny town between the college town of Charlottesville, Virginia, and White Sulphur Springs. U.S. Senator Bill Cassidy, a doctor, said he and other lawmakers who are physicians tended to the injured until emergency personnel arrived. The truck was on the tracks at a crossing when the crash occurred, Amtrak said. Video from the scene showed the battered truck afterward, with trash strewn around it. "We were going along the Virginia countryside at pretty good speed," Senator Jeff Flake said in comments released by his office. "All of a sudden, we felt an impact and obviously heard a pretty loud noise. Most of us were thrown a bit in our seats and those of us who were standing were really thrown." Spouses and children of some lawmakers were aboard, lawmakers said. House of Representatives Speaker Paul Ryan was on the train, but Senate Majority Leader Mitch McConnell was not, lawmakers said. "It was clear upon impact that something had gone terribly wrong and I am very grateful that the train was able to stop without severely derailing," U.S. Representative Lee Zeldin said in a statement. Immediately after the crash, a law enforcement team surrounded the train with weapons drawn and searched the area for possible attackers as first responders treated the injured, said a local emergency worker, speaking on condition of anonymity. "They surrounded the train on both sides and set up a perimeter with their automatic weapons pointing out and then searched the woods around the train," the worker said. "At least five members of Congress helped firefighters and EMTs (emergency medical technicians) treat the three injured people who had been in the truck." The Republican retreat, an opportunity for lawmakers to discuss both legislation and politics in the run-up to November's congressional elections, was scheduled to run until midday Friday. President Donald Trump was due to attend on Thursday and Vice President Mike Pence on Wednesday. The U.S. National Transportation Safety Board said it was sending a team to investigate the crash. It was the second tragedy to hit congressional Republicans in the past year. Last June, a gunman opened fire at a baseball field in Alexandria, Virginia, where Republican lawmakers were practicing for an annual charity game against Democratic colleagues. Representative Steve Scalise, the No. 3 House Republican, was severely wounded but has recovered and returned to work. He was not on the train. While it was not immediately clear who was at fault in the Virginia collision, Amtrak's safety record has come under scrutiny after a series of recent incidents including a derailment of a passenger train south of Seattle in December that killed three. In that crash, an engineer misread a signal and failed to slow the train, investigators said. The Virginia Department of Transportation said the intersection where the crash occurred had flashing signals and gates to prevent motorists from getting on the tracks when trains were approaching. There have been three reported crashes within 250 feet (76 meters) of the crossing since 2007 but no prior incidents involving a train, it said.